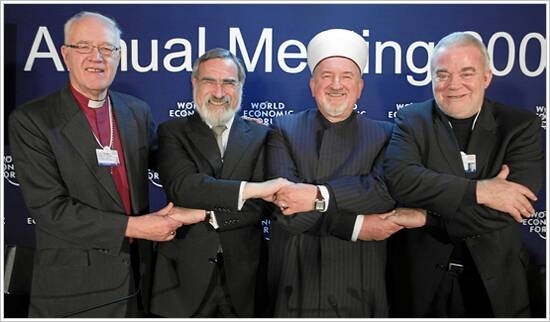 Is Interfaith Dialogue Good for Religious Jews? You may recall that last year, when By Light of Hidden Candles was released, I mentioned a certain reviewer of the observant Jewish persuasion who felt uncomfortable with the relatively positive portrayal of Christianity in the book. Well, I also mentioned this in my TOI blog post on interfaith dialogue, and the reviewer in question happened to read it. She reached out to me, we respectfully debated the matter, and she decided to post our correspondence on her blog. However, I recently discovered that she has deleted the post (no idea why). And since I’d still like my position to be out there, I decided to write my own post about it based on some of the answers I gave her. ANYWAY. Where were we? Right–the scandalized reviewer. Below are some of the points she raised, rephrased in my own words, and my responses to them. It makes sense to respect Christians as human beings, but why should we respect Christianity–a belief system that we believe is false? For starters, I want to make clear what I mean when I say that I have “respect” for Christianity. Respect doesn’t mean “agree with”. It doesn’t mean “condone”. It doesn’t mean “support”. It means “appreciate”–in the sense of hakarat hatov, gratitude, or ayin tova, generosity/seeing the good in something. I don’t think you have to agree with something to appreciate the good things about it. I think it is possible to respect a religion (and not just the people who believe in it) without agreeing with it or supporting every part of it. Obviously, I completely reject the foundations of Christianity and the beliefs on which it was built. I have a post here in which I am very clear-cut about this (“What Do Jews REALLY Think About Jesus?“). That doesn’t mean I have to completely hate and be repulsed by everything about the religion. Why would friendly contact between religious Jews and religious Christians be a positive thing? After that op-ed I mentioned was published, I got a message from Lee Weissman, one of the founders of the wonderful Facebook group for discussion between Jews and Muslims, Abraham’s Tent. Lee is a religious Jew with long payot (sidecurls) and a beard and he wears a streimel on Shabbat. He is also very involved in interfaith activism, particularly with Muslims. Lee thanked me sincerely for my post and said that it saddens him that so few Jews with rich religious lives are involved in interfaith activities. “When deeply religious folks talk to one another, there is a whole different dynamic,” he said. I think most interfaith discussion and activity we encounter tends to be wishy-washy, with each side coming from a very watered-down version of whatever their faith is, and that’s a shame. Like Lee, I think that discussions between people are actually very committed to their different belief systems can be much more powerful and meaningful and should not necessarily feel threatening to either side. I would go so far as to say it’s a sign of maturity and security in your own beliefs when you are able to open up and listen to people who think differently than you. What value can a religious Jew get out of such discussions, if not to influence the other person to come closer to an authentic relationship with God as we believe in Him? First of all, I see these conversations as being of value to me, not necessarily to the other person–though of course I hope the feeling will be mutual. It’s not about them or what they believe. It never was. Judaism does not condone or support proselytizing, and I don’t think there’s any point in trying to convince other people to believe what you do. I find that discussing Judaism with people of other faiths–explaining what I do and what I believe–strengthens my own commitment to Judaism. My goal is not to get them to change their beliefs, but just to help them understand who I am and where I’m coming from (which is the basic premise of this blog). Discussing our differences helps me delve more deeply into my own beliefs and clarify why I believe them and what they mean to me. These interactions inspire me and make me feel closer to God and to Judaism. On a more personal level, I have noticed that there is a fundamental difference between my ability to connect with believing Christians over matters of faith and my ability to connect with almost anyone else–including many religious Jews, secular Jews, and even religious Muslims (with whom I generally have more in common than religious Christians). There is something about the way many Christians talk about God that really resonates with me. There’s a simplicity, an innocence, a sort of humility and wholehearted trust in God, that makes me feel comfortable talking about my relationship with God in superlatives and with child-like wonder, even with someone I hardly know. I can have this experience with other Jews of a certain flavor, but I think with Jews, everything tends to be more complicated, partly because Judaism is so complex, and partly because we already have so much in common. With Christians, talking about our relationship with God is our one common language when it comes to faith. Maybe that’s why it’s easier to cut right down to the deep stuff. Or maybe it’s something about the way Christians are educated. I don’t know, but it’s a definite pattern I’ve noticed. Her author doesn’t find it ironic at all. But isn’t there a potential danger of certain boundaries being crossed? And I think By Light of Hidden Candles is, among other things, a sort of meditation on that question. I think my position on this should be clear from A) the fact that I wrote that book and B) the fact that I write this blog. I do think it’s possible to define and maintain appropriate boundaries, but it’s not something to be taken lightly; and though I struggle with it myself sometimes, I think there are enough benefits to justify the dangers–for me, personally. I think it’s a very individual question and I wouldn’t necessarily encourage everyone to make the choices I’ve made. So in response to the question posed in the title of this post–is interfaith dialogue good for religious Jews?–I think it can be. And also not. It depends on the person, the circumstances, the goals of the individuals involved, and many other factors. But doesn’t Jewish law consider Christianity to be a form of idolatry? Now here is the real can of worms. 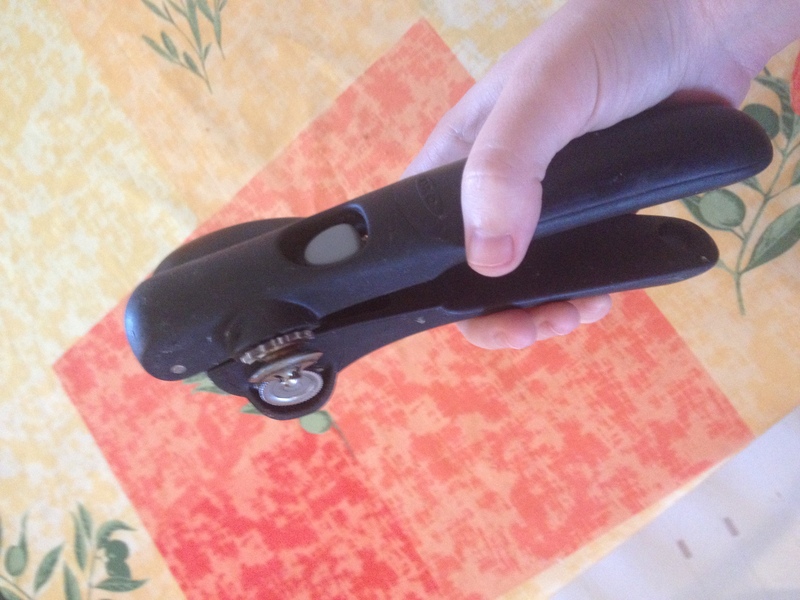 Time to get that can opener out again! Yes, the majority of rabbinic authorities does consider Christianity to be a form of idolatry. While the majority opinion among sages–including the Rambam–is that Christianity counts as idol worship, there is also a respectable faction of rabbinic authorities who reject this idea–such as the Meiri (Menachem ben Solomon Meiri, 13th-century Catalan Talmudist), Rabbenu Tam (Jacob ben Meir, grandson of Rashi, 12th century France), the Rema (Rabbi Moshe Isserles, 16th century Poland), and our friend the Ramban (a.k.a. the Badass Rabbi of Catalonia). It’s important to note that the Rambam was born in Muslim Cordoba and spent most of his life in Muslim Cairo, so he probably didn’t have much contact with Christians. The Meiri, Rabbenu Tam, the Rema, and Ramban, by contrast, all lived among Christians. Furthermore, when one analyzes the writings of the Rambam in which he describes Christianity as idol worship, it is not obvious that this definition applies categorically to all types of Christianity. There are a few reasons to consider Christianity a form of idol worship. The most important one is that the entire concept of the Trinity, which divides God into three “aspects” or “persons”; and we believe that “dividing” Him into three parts is still a form of idolatry even if you believe they are all parts of the same God. Same goes for the belief that God would manifest Himself in a human in any way (the divinity of Jesus as a son of God). Another problem is the use of icons, especially among Catholics. We understand that when a Christian kneels before a cross or a statue of Jesus or Mary, they are not really praying to the statue, but using the statue as a physical representation of the invisible God they are praying to. Still… I’m sure you can understand how we’d find that problematic. It’s right there in the Ten Commandments: “You shall not make for yourself a graven image or any likeness… You shall not prostrate yourself before them” (Exodus 20:4-5). If you look at the nafka minnas–the practical applications of these opinions–you’ll see that the Jewish attitude toward Christianity is not at all clear-cut. For example, most authorities forbid a Jew to set foot in a church, but they permit it if there is a case of need, such as, oh I don’t know, a tour guide who needs to take some Christians into a church while leading a tour. 😉 Idol worship is one of the big three commandments we’re supposed to give our lives over rather than transgress, so if Christianity were really considered equivalent to idol worship, a financial need would certainly not be grounds for lenience. Also, there are a number of commandments pertaining to idol worship which we categorically do not apply to Christians. We are commanded to destroy idols and their accessories (Deuteronomy 12:2)–no one is advocating destroying churches and Catholic icons. We are commanded never to make a covenant with idolaters or show favor to them (Deuteronomy 7:2); no one is saying we shouldn’t have political or economic treaties with Christian nations or give them favorable treatment. Well, unlike you, today’s guest lives in a country where they don’t need armed guards interrogating people at the door. Jacquelyn Lofstad is a 19-year-old college student from Minnesota, United States, who was raised in a Baptist family. She’s a reader who stumbled across the blog through Google, and her submission of this letter was the first contact she made with me (which is a first–all previous guest letters have been by people I know from other contexts and/or who I cajoled asked to write one!). She also writes a blog of her own about the Old Testament and how it relates to Jesus and the gospels, partially inspired by a trip she took to Israel not long ago. She decided to share with us about an experience she had recently: observing the Shabbat morning prayer service in an Orthodox synagogue. (For those of you who need more info on what Shabbat is, click here.) I think this is a beautiful counterpoint to our previous guest letter, which was about a Jew’s positive experiences in churches! Recently, I had the privilege of celebrating Sabbath at an Orthodox Synagogue. The Jewish people are beautiful, dedicated, and tenacious in their faith. I was extremely blessed to be able to observe a Shabbat (sabbath) service. I am a 19-year-old college senior from Minnesota, United States, studying music education and history. I was raised in a Baptist family but do not swear complete allegiance to any particular denomination. I just believe the Bible, want to honor God and love people in the process. After visiting Israel over spring break for a Bible study trip, I gained so much respect for the Jewish people’s tenacity and dedication to their faith. Also, I love the Old Testament and am frustrated that the church does not talk about it enough. Researching Judaism seemed like the obvious answer. Wanting to learn more, I contacted a local rabbi and asked to observe a synagogue service. I entered the room during prayers and was handed a prayer book with English translations – praise God! My lack of education was clearly shown when I forgot that the Hebrew language and therefore the prayer books, read right to left! One thing that struck me about the Hebrew prayers was how focused they were on God and God alone. So often I will only pray to ask for things. Their prayers focused on the glory, majesty, power, and love of Hashem (Hebrew name for God, literally translated as “the name”). After the prayers, the Torah was brought out. The cantor and the congregation sang and chanted with joy as the Torah was lifted out of the arc in the front of the room and brought to the center of the congregation. The blessing of having the word of God IS something that we should rejoice over. The Torah in the center reminded me how God is a God for all people. He comes down, right into the middle of our lives. The word of God speaks right into the middle of our messy situations. The Torah reading for this day the “snake being lifted” in Numbers. They also read from the prophets on a yearly rotation – this week the men read from 1st Samuel. The rabbi then spoke about a former rabbi who died at the hands of communist Russia because he refused to be transported on the sabbath. While he could have easily justified breaking sabbath to save his life, he decided not to because of the people that looked up to him. While I do not have the same sabbath convictions as the Jewish people, I also have people looking up to me. I need to take my actions seriously, because as a teacher, I will have people looking at my life as they make decisions. After the service, which was over two hours (they are dedicated people), I was invited to the Kiddush lunch afterwards. The stew was cooked the night before and left on the stove because no cooking is done on the sabbath. One lady told me about how she read a book about how a Christian converted to Judaism because she felt like Yom Kippur offered more room for grace than Christianity. This saddened me because we clearly are not showing/sharing the love and grace of God that well then! I had a long conversation with another woman about Israel, Judaism, and many other things (Israel actually opened many doors for conversations so praise God!). She shared how it was difficult to get a job without working on Saturdays. I again was struck by how these people’s first priority was their faith. I can learn from this. I was then asked why many Christians don’t like Israel (This question was a bit stressful–19-year-old having to answer for all Christians 😛 ). I responded by saying that many Christians misunderstand both the heart of God and the Jewish people. At the end of our conversation, we thanked each other for sharing our perspectives–it was a really sweet moment. Are you a reader who has something interesting to share with Josep and me about religion or culture? Don’t be shy–be like Jackie! Submit a guest letter! I am very excited to present this guest letter about the Baha’i faith. As I’ve mentioned before, I hang out on some online interfaith groups, and Bobby recently joined one of them, saying he’d like to learn more about other faiths. When he mentioned that he is Baha’i, I immediately asked to interview him for a guest letter. Baha’i is a monotheistic faith, relatively recent in origin, that is not widely known. 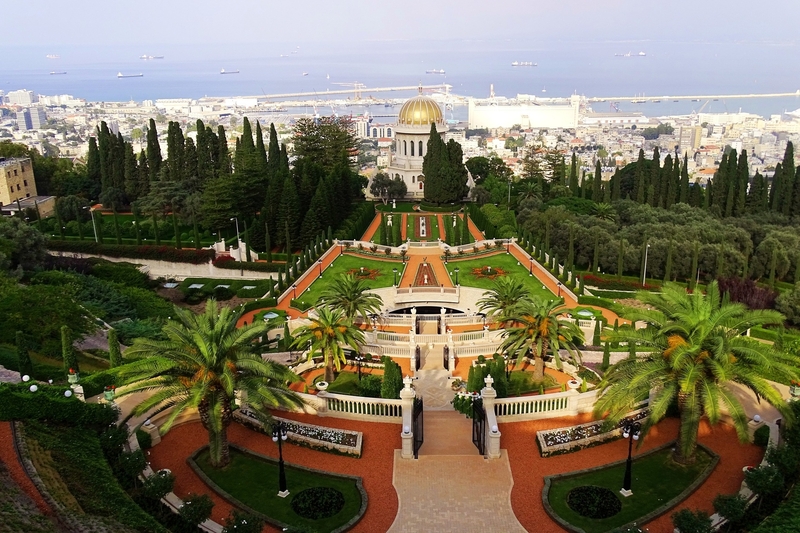 I only learned of its existence because of the beautiful Baha’i Gardens in Haifa, Israel, which I have seen from afar, but never visited. So what’s the deal with these people? Who are they, and what do they believe? I asked Bobby, and as my understanding of the Baha’i Faith deepened I gained a sense that it has an extremely important message for people of all religions, especially those of us who believe in interfaith dialogue and connection. I hope you enjoy this letter as much as I did. My name is Bobby, and I’m a Baha’i living in Missouri, USA. I wasn’t born into a Baha’i family–my family are all Christian–but when I was 14 my grandmother passed away and I started to think about religion more seriously, a friend of mine introduced me to the Baha’i faith and after investigation I realized that (for me at least) it’s the truth. Tell us a little about the background of the Baha’i faith. What does the word “Baha’i” mean? Where, when, and how was it developed? What are its main theological principles? The three central figures of the Baha’i faith are as follows. The first is the Bab, who was the forerunner of Baha’u’llah, prophesying Baha’u’llah’s coming. The Bab declared in 1840 that he was the Mahdi, the 12th Imam of Islam that was prophesied to return before the coming of the Promised One. The second is Baha’u’llah. He is the divine Messenger for our age. The third is Baha’u’llah’s son Abdu’l-Baha. He was the leader of the Baha’i faith, writing many invaluable books about our faith. Some of the most important principles of the Baha’i faith are: harmony between science and religion, equality between men and women, unity of humanity, and unity of religion. I understand that the Baha’i faith recognizes all other monotheistic religions as stemming from the same spiritual source, and that it celebrates diversity of worship. Does that mean that the Baha’i faith recognizes all those other religions as being true, in the sense that Jews, Christians, and Muslims are all correct in their understanding and interpretation of God’s will? Or is it that the technical details don’t really matter, as long as we are devoted to serving God and humankind? The Baha’i faith teaches that all religions are true and contain the seeds for the message of the next of God’s Messengers, but Baha’u’llah taught that the adherents of the previous religions erred when they created sects/denominations. Because God is a perfect unity, without division of any kind, his religion is one. The creation of division in religion and all the fighting it’s caused is harmful to the peace God wants us to obtain, but ultimately all religions are correct because the are the revealed divine will of God. I can understand and get behind the idea of this as a sort of general principle–at the end of the day, we’re all trying to achieve the same thing. But it gets complicated when we talk about specifics. Because some beliefs in one religion absolutely contradict the beliefs in other religions. For example, Christians believe that Jesus was the Messiah and a human manifestation of God. Muslims believe he was a prophet. Jews believe he was none of those things. This is far more than a squabble over a minor detail; it results in a completely different understanding of the will of God. So, how can we all be right? 😉 If all religions are the revealed divine will of God, why does it appear to contradict itself? The issue is not so much with the religion and the religious texts (which would cause the religion to not be the true word of God), but rather the problem is with how man interprets the writings. We believe that Jesus did fulfill the prophecies to be the Messiah, but not all Jews believe this because they interpret the prophecies in different ways than Baha’is. For instance, we believe that the prophecy that the whole world shall know God and worship him has nearly been fulfilled thanks to the spread of Christianity and Islam. If it weren’t for Jesus sending out his followers to spread the faith, the majority of the world would not believe in God. Another prophecy is that when he [the Messiah] comes there will be a resurrection of the dead. This is one of the 13 principles of Jewish faith.1 We believe this happened spiritually rather than physically. The Jewish faith was in a great time of changing and turmoil 2,000 years ago with the Roman invaders, and Jesus’ coming caused the dead spirits of the Jewish people to come back to life. The Jewish people (speaking of those who rejected Jesus) really flourished in their writings and deeper understanding of Torah post Roman invasion up until not too long ago. Now as for the Muslims, they have two classes of Prophets. The first is Nabi, the second is Rasul. A prophet is a Nabi, someone who is inspired by God, but the Rasul is the Divine Messenger of God (Noah, Abraham, Moses, Jesus, and Muhammad are on this list), and they consider Jesus to be Rasul. So there are no contradictions between the religions. It is a progressive revelation. The only issues are with interpretations. But from my understanding of Baha’i writings this is what God wants. He doesn’t want there to be only Christians or only Baha’is. He wants all of his religions to exist at the same time in harmony, with the understanding that they are one religion. I think I get it. You believe that all religions were meant to be the same, and Baha’i has its own understanding of the religious texts and how they all fit together. So it’s not so much that you think the Christians, Jews, and Muslims are all “correct” per se, but that the Torah, Christian Bible, Qur’an, and other holy texts are all the word of God, and the discrepancies between the religions are the result of the (according to you) erroneous ways we interpreted and applied them. Is that correct? Simply put, yes, that is the belief. But to err is human, and the Baha’i writings say that no matter what one’s faith is, if he practices with conviction, he is in the right. So even a Jew who rejects Jesus is considered right in their practice of the religion of God, from my understanding, because they don’t have to accept Jesus to still have the (a?) correct religion 🙂 Many Baha’is go to synagogues, mosques, and churches every week to learn and commune with our spiritual brothers and sisters. We wholeheartedly believe that you all have the truth. It’s just your doctrine on certain things that we have a different understanding of. I feel that we live in a world where a sort of “zealous ownership over religious truth” lies at the heart of the biggest and bloodiest conflicts. What do you, as a Baha’i, wish members of all these different religious groups would recognize about each other? How do you think we can navigate these differences in our belief systems, when they appear to be mutually exclusive? As a Baha’i I wish that everyone would realize we all worship the same God, albeit in different ways. If we could realize that our seemingly different religions are actually the same, once you strip away the cultural influence and superstition, then, I think, we could end religious prejudice. How do you practice the Baha’i faith on a day-to-day basis? What calendar do you follow, and what festivals do you celebrate? The Kitab-i-Aqdas, the Most Holy Book of the Baha’i faith, is the record of the commandments of God for our age, it tells us our day to day responsibilities as Baha’is. Among these are the Obligatory Prayers in the morning, at noon and at sunset. Another command is for daily meditation while reciting Allah’u’Abha2 95 times. We use the Badi calendar created by The Bab. This calendar has 19 months with 19 days each, also containing intercalary days that have became a gift giving holiday for the Baha’i called Ayyam-i-Ha. Some other holidays are Naw Ruz which is the Persian new year, the martyrdom of the Bab, the Ascension of Baha’u’llah, the Day of the Covenant, and others. What is the significance of the Baha’i Gardens in Israel to your faith? Have you ever been there? The Gardens of Haifa are a holy place in the Baha’i faith. They go up the side of Mount Carmel to the shrine of the Bab, and lead to the Shrine of Baha’u’llah in Bahji, Akka (a.k.a. Akko or Acre), Israel. Baha’is make pilgrimage to these holy spots at least once in their lifetime if able, but sadly I have not had a chance. According to Wikipedia, there are somewhere around 5-6 million Baha’is in the world. Are you part of a community? What is your experience of belonging to a faith that is relatively unknown, that many people you meet may never have heard of? According to the latest enrollment numbers from The Universal House of Justice (the closest thing Baha’is of to a “church”) there are 7.6 million enrolled Baha’is around the world. Unfortunately none of them live near me! I would love to live in a community; Baha’is get together every nineteen days, that is, the first of every month on our calendar, for a feast. How wonderful community life would be! But a good thing is that I have many people to educate on the Baha’i faith around here. What are some of your favorite things about being Baha’i? My favorite thing about being a Baha’i is that I never have to say that I’m right and everyone else is wrong. My second favorite is that the Baha’i faith teaches that hell is a metaphor not a real place of torment. Is there anything else you think is important for us to know about the Baha’i faith? The Baha’i houses of worship (one on every continent!) are open to members of all faiths. I very much recommend visiting one! 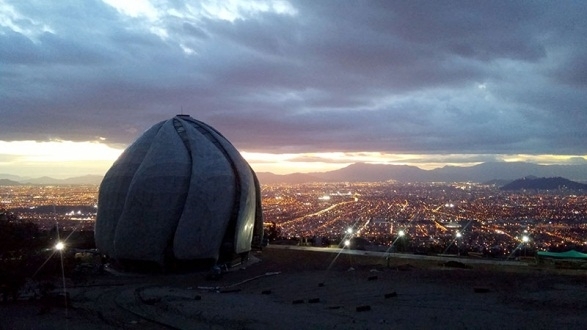 I adore the House of Worship in Chile. Do you belong to a lesser-known faith, or a smaller sect of one of the major religions? Want to share your unique perspective? Write us a guest letter of your own! Ahem. Anyway. Abi’s letter is about interfaith prayer, and I felt it was fitting since I have been covering the topic of prayer, and in honor of Ramadan, which began last night. Speaking of which, we have a great upcoming guest letter on Ramadan, so stay tuned! 😉 I also have another, related story that I will share after her letter. Chodesh tov, Ramadan kareem, and enjoy! I’m Daniella’s friend Abi and like Daniella I am also a Modern Orthodox Observant Jew. I find your relationship with Daniella inspiring and I wanted to share with you today some thoughts about interfaith prayer. I recently saw this video about an organized event bringing Jews and Muslims to pray together. Here is the video. Watching it reminded me of a wonderful experience I once had in my college in Jerusalem. I would always look for an empty classroom in the break to pray the afternoon prayer, mincha. (There is actually a synagogue on campus but it was locked most of the time.) Often people would come in in the middle of my prayers if they had a class there after the break and sometimes I would get very distracted, so I always hoped nobody would come in. On one such afternoon, I had already started praying and I noticed out of the corner of my eye a female student walking in. I was hoping she wouldn’t distract me by talking on the phone and that more people wouldn’t come in. But then she knelt down and prostrated herself and I realized that this was a Muslim woman and that she was joining me in prayer. It felt very special to be praying side by side, in different ways, but to the same G-d. My kavana (intention and focus on prayer) intensified and I felt so grateful to this woman for joining me. I can’t quite describe the feeling that washed over me but I felt very connected to my prayer and to G-d at that moment. She finished before me and she left and by the time I had finished she was gone. I really wanted to thank her for having the courage to join me and tell her how much it meant to me, but I didn’t know where to find her. Listening to the joint prayers on the video reminded me of that feeling of connection to G-d and to each other through prayer. I pray that we learn to love ourselves, each other and G-d, and find many ways to connect. So here’s my story, which is actually my husband Eitan’s story. Eitan is a rabbi and tour guide, and a couple weeks ago he was guiding a very special “interfaith” group of college students from the USA–mostly Christians, but a Muslim and a Jew as well. He had a similar experience to Abi’s when the Muslim girl asked to pray the afternoon prayer him while they were in the Old City, and they did, Eitan facing the Temple Mount and the student facing Mecca. But that’s not what the story is about; it’s about the stop they made in the White Mosque in Nazareth. The man who received them and showed them around was an Arab Muslim in his 70’s. When asked if Shia Muslims were also allowed to pray at the mosque, he said, “Sure, Muslims of any denomination can pray here. Jews can pray here too.” He told of a time 50 years ago when he was close to his Jewish Moroccan neighbors, and their families would eat from the same serving plates. “Nowadays everything is politics,” he lamented. He then showed the group how he uses his prayer beads. Eitan remarked that it made sense to have something to fiddle with while one prays to aid concentration, and joked that he should get something like that to play with too. The man said, “Here, take mine!” And he gave Eitan his prayer beads. 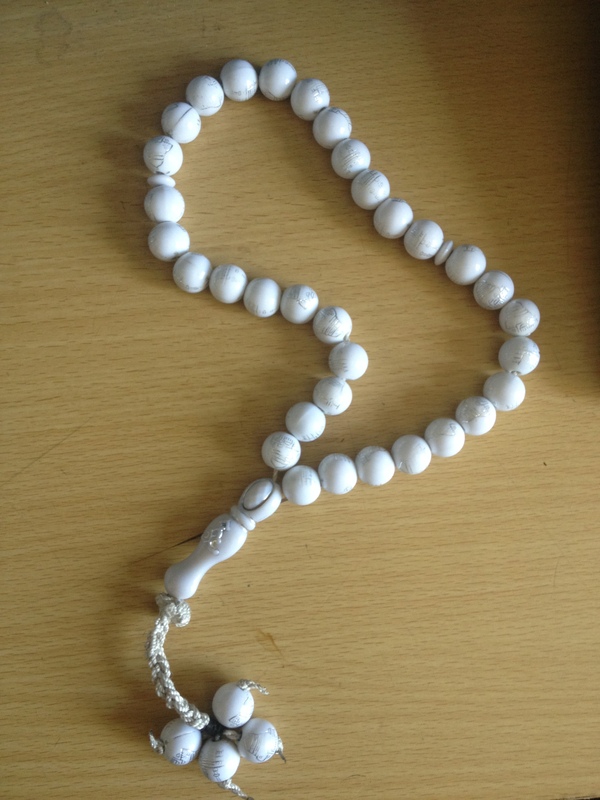 The prayer beads he gave Eitan. Muslims use them to help them keep count when reciting the 99 names of Allah. They hugged, and Eitan says when he turned back to his tourists, there wasn’t a dry eye in the group. Inshallah (God willing–Arabic), od yavo shalom aleinu (peace will yet come upon us–Hebrew). Blog readers: Abi, Josep and I would love to hear about any experiences you may have had of connection to people of different faiths. You can share with us in the comments, or write your own guest letter!